The Lady Govs basketball team is on the hunt to snap a nine-game losing streak after their last win against Trevecca Nazarene University at the beginning of November. With an overall record of 2-10, the Lady Govs haven’t found the formula to winning on the road, considering both of their wins took place at home. After suffering a season ending ACL injury her freshman year, Falon Baker, a sophomore from Portland, Tenn., regained her shooter’s touch at the beginning of the season and contributed 16 points off the bench against Trevecca for a 97-75 win. 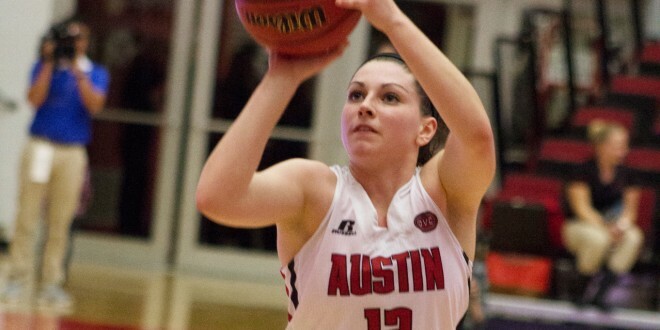 Since their win against Trevecca at the beginning of the season, the Lady Govs have failed to capture another win. The smallest losing point spread this season has been an 8-point spread against Kennesaw State and the largest coming in at 32 points against Indiana. The Lady Govs will return Jan. 1, to the Dunn Center in Clarksville, Tenn., for a three-game home stand against Eastern Kentucky, Jacksonville State and Tennessee Technological University where they hope to break their losing streak and continue to add to their winning record at home.